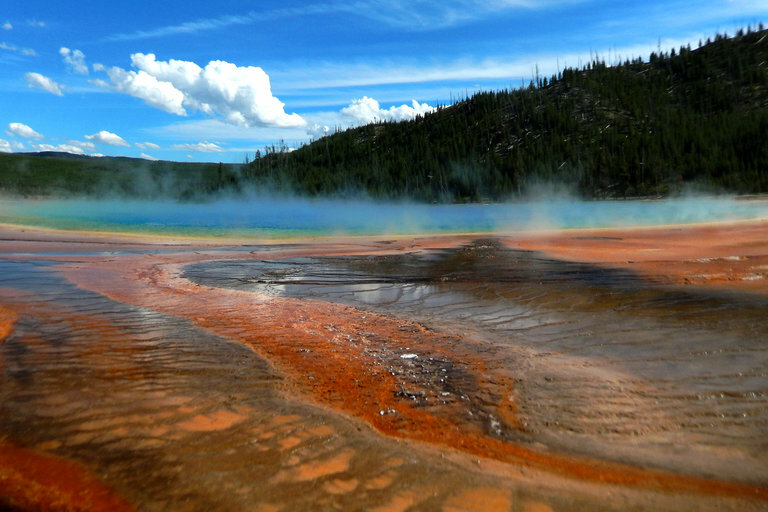 New images prove that the Yellowstone hotspot is powered by superheated magma rising up from Earth’s core. T	T	he last Yellowstone supereruption occurred roughly 640,000 years ago, creating the massive, 40-mile wide Yellowstone caldera and producing an umbrella-shaped ash cloud that blanketed areas as far away as modern-day New York with several millimeters of ash. The prospect of another cataclysmic supereruption has sent scientists on a decades-long search for the source of Yellowstone’s devastating power. Yellowstone is one of the few volcanoes in the world that’s not located along a plate boundary, the seismically active zones where two tectonic plates meet. Like the volcanoes that formed the Hawaiian Islands, Yellowstone is situated over an intraplate hotspot, a seemingly random upwelling of magma from the simmering mantle below. Back in the 1970s, geophysicist Jason Morgan — the father of plate tectonics — posited that hotspots were caused by rising plumes of superheated magma that originated deep in the outer core. But despite widespread acceptance of the deep plume theory, geoscientists have failed to produce seismic imaging of just such a mushroom-shaped plume extending 3,000 kilometers down to the core-mantle boundary. A Ph.D. student from the University of Texas used an innovative method for analyzing deep seismic waves from large earthquakes to reveal a cylindrical column of hotter-than-normal magma rising from deep below Mexico and surfacing right below the Yellowstone supervolcano, according to a paper published in Nature Geoscience. Peter Nelson is a fourth-year doctoral student in the Jackson School of Geosciences at the University of Texas at Austin and co-author of the new paper, which provides the first convincing evidence of a deep-mantle plume beneath Yellowstone. The plumes that originate at the core-mantle boundary may have greater density or may simply be caused by thermal instability between the molten iron core and the cooler mantle material surrounding it. To capture an image of such a plume, geologists like Nelson use something called seismic tomography — the Earth’s equivalent of a CAT scan. Nelson knew he was looking for a magma plume that was hotter than the surrounding mantle and vertically oriented. So he chose a specific type of deep seismic wave called an SKS wave that’s only produced by the biggest earthquakes. These waves are powerful enough to originate on one side of the planet, bend through the Earth’s core, and trace a nearly vertical path toward the surface on a completely different side of the planet. SKS waves travel slower when they pass through hotter material, but the time difference isn’t huge. To capture subtle timing shifts occurring thousands of kilometers below the surface, Nelson relied on data from a dense cluster of seismometers called the USArray. By carefully timing the travel speeds of SKS waves as they rose vertically underneath Yellowstone, Nelson hoped to snap an image of the mushrooming plume in action. Incredibly, he got his shot. The SKS data paints a clear tomographic picture of a plume of hotter material rising from 3,000 kilometers below the Mexico-California border and swelling upward on a slight angle toward Yellowstone National Park in western Wyoming. The big question is whether the confirmed existence of this deep plume of magma proves that Yellowstone is due for another supereruption that could reshape the landscape of North America. Nelson said that while his research doesn’t say anything directly about the timing or danger of a Yellowstone supereruption, it does prove that the massive energy driving the volcano ultimately comes from the core of the Earth itself, and that the plume feeding the Yellowstone hotspot isn’t going away anytime soon.